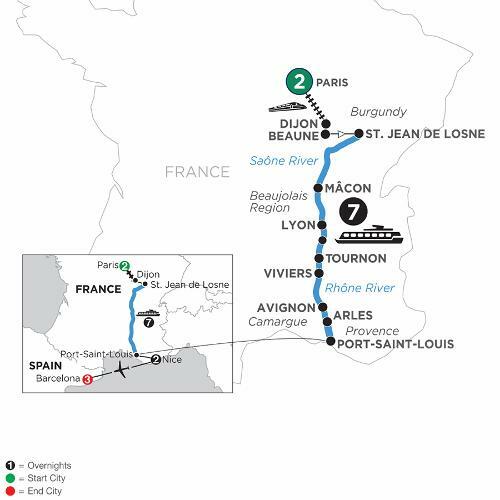 This afternoon, travel to St. Jean de Losne to board your Suite Ship® . Beautifully nestled among vineyards, you’ll find the twin cities of Tournon and Tain l’Hermitage, where you’ll go on a guided walk of Tournon, a medieval treasure with plenty of Roman ruins and fascinating 16th-century castle. Continue to Viviers for a guided walk through this charming village. Cruise to historical Avignon and see the 14th-century Palace of the Popes—the largest gothic fortress in the world. On the Rhône River sits Arles, with its 1st-century Roman amphitheater still used today. Attend a painting workshop in the style of Van Gogh whose work was inspired by the setting here. You’ll conclude your delightful French river cruise in Port-Saint-Louis. Continue your French vacation your way after your cruise two nights in Nice and 3 nights in Barcelona! Enjoy buffet breakfast daily, your personal Monograms Local Host® for guidance and assistance, destination guide with city map, a flight from Nice to Barcelona, transfers from ship to hotel, and hotel to airport.